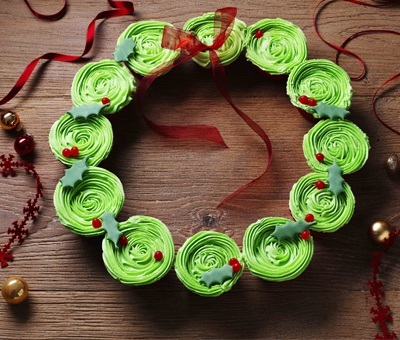 These delicious 12 cupcakes create a stunning Christmas wreath great for the festive season. Preheat oven to 180°C (160°C for fan ovens), Gas Mark 4. Place the cupcake ingredients in a bowl and beat with an electric hand mixer for 2-3 minutes until pale and creamy. Spoon mixture into the muffin cases. Bake for 15-18 minutes until springy and golden. Transfer to a cooling rack to cool. Beat icing sugar, buttery baking spread, vanilla and green colouring, with enough condensed milk to make a thick icing. Pipe in a spiral from the middle of the cake outwards making sure you cover the edge of the cupcake case. To make the leaves, roll out the green icing to 0.5cm depth and cut out holly shapes, cut the red jellies in half. Put the cupcakes on a large cake board or wooden board in a circle. Place the holly leaves and jellies onto the cupcakes and top with the ribbon bow. Get creative with your wreath decorations, try more, smaller bows or using star or snowflake cutter shapes.